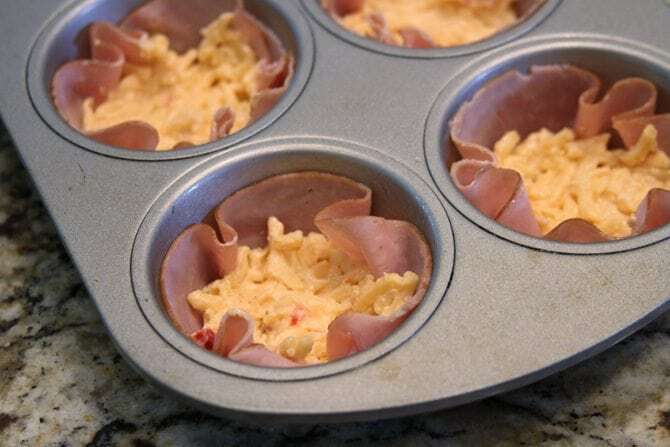 Y’all, these Baked Ham and Pimento Cheese Cups are so good and so easy! I just love how the salty ham gets a bit crispy around the edges and then you’ve got the gooey cheese, they’re just delicious. And they’re easy enough for a busy weekday morning, but fancy-looking enough for company. 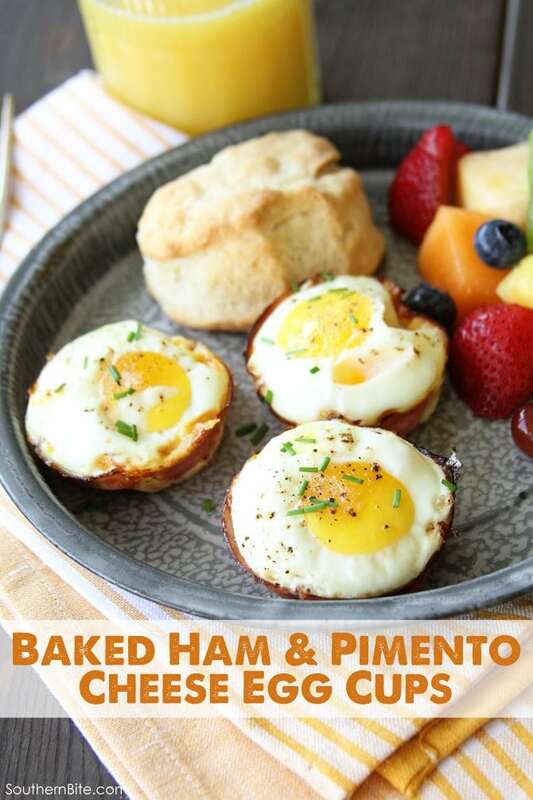 To start, you’ll need some thinly sliced ham, some prepared pimento cheese (I like the Palmetto Cheese brand), some eggs, and some salt and pepper. Now, you can make as many of these as you need. I usually make two for each person, so I made 6 in this batch. 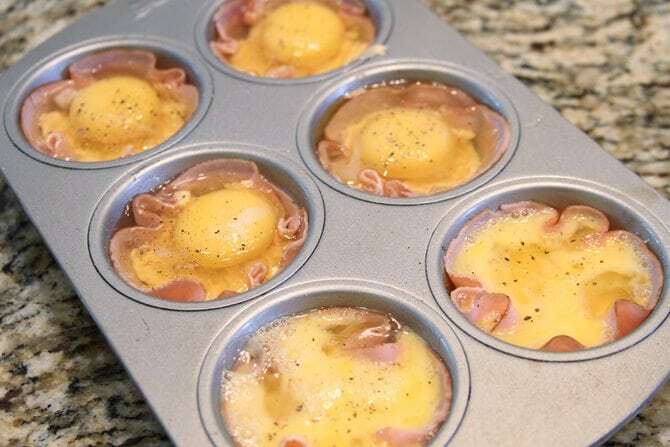 You lightly spray a muffin pan with nonstick cooking spray then place a slice of ham in each cup. Next place about 1 tablespoon of the pimento cheese in each cup. Press it with the back of a spoon to get it all the way down in there and spread evenly. Next, crack a small egg into each cup. For those of you who prefer scrambled eggs, you can simply crack the egg into a small bowl and scramble it before you pour it into the cup. Top each with a little salt and pepper and then bake them in a 350°F oven for 15 to 20 minutes, depending on how you like your eggs. See, there you go. Easy-peasy, lemon-squeezy! Breakfast is served! Y’all enjoy! Preheat the oven to 350°F. Lightly spray the cups of a muffin tin. 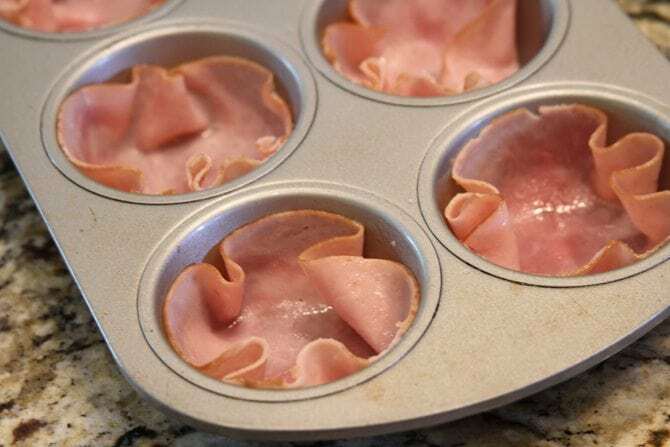 Carefully place a slice of ham into each cup, ensuring it covers the sides. There will be some overlap. Scoop 1 tablespoon of pimento cheese into each cup and gently press it into the bottom. 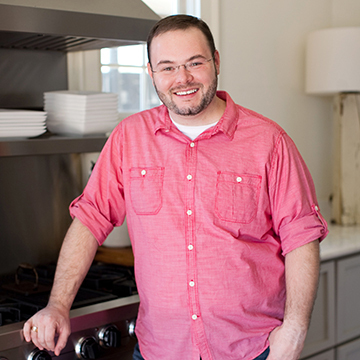 Crack an egg into each cup over the pimento cheese. You can also crack the egg into a small bowl and scramble it and then pour it onto the cup if that's more your speed. 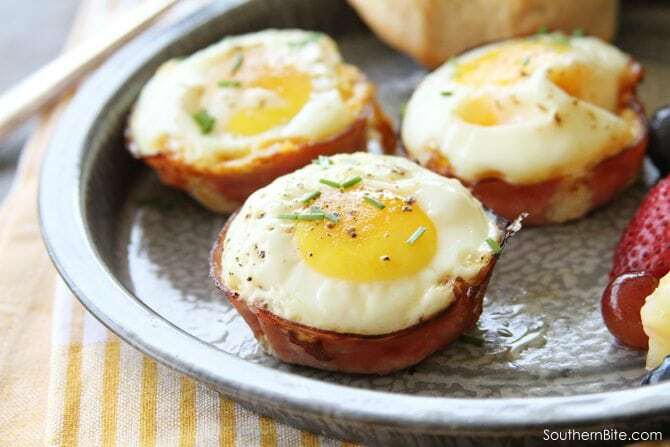 Sprinkle with salt and pepper and bake for 15 to 20 minutes, or until the egg is done to your liking - shorter for runny yolk, longer for firm yolk. Serve immediately. I LOVE pimento cheese and can’t wait to try this recipe! 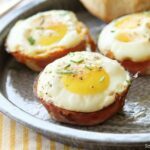 It’s so easy and is a great twist on breakfast! 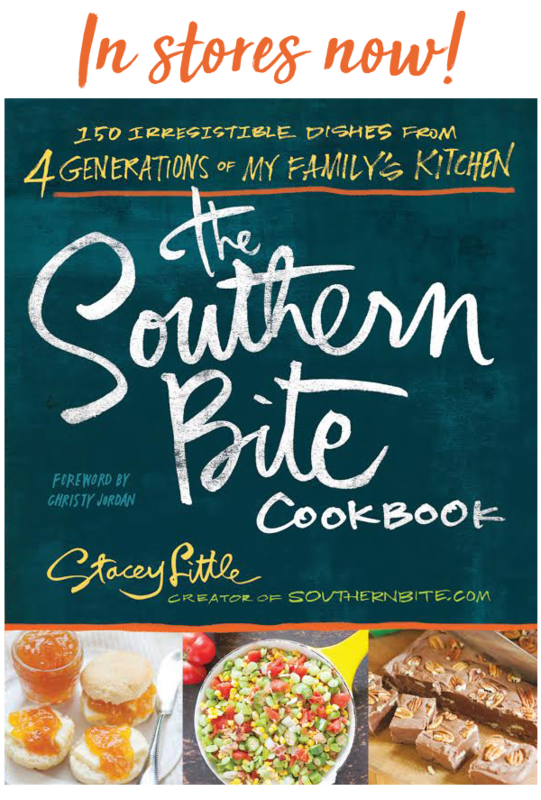 I am not a southerner. I have never (to my knowledge) eaten pimento cheese. Some years ago an acquaintance from Kentucky quizzed me on whether or not I like “minter cheese”. About 6 hours later, I figured out he was saying Pimento Cheese. This recipe looks appetizing. Guess I’ll go buy some minter cheese. I’m definitely going to try these! Only problem I see is I detest store bought pimento cheese – I much prefer making my own. I don’t believe that should pose a problem though? Not at all! Homemade would be perfect! I LOVE pimento cheese and this recipe sounds fantastic! I can’t wait to try this one. I have never had homemade pimento cheese….I think I need to change that! I love pimento cheese, and I’m always looking for breakfast recipes that I can pack for my husband to take to work with him. I think these will be perfect – can’t wait to try them! I sure hope y’all enjoy them! Love homemade pimento cheese or “Palmetto” pimento cheese for store bought. Only this brand if store bought. Especially the jalapeno Palmetto brand. Can’t wait to try -love eggs and this would be different. Put together the night before and then bake while getting ready for work!!! Thanks for a new way for eggs. My family sure loved these. Hope you will too! Hi Stacey! Those look amazing. 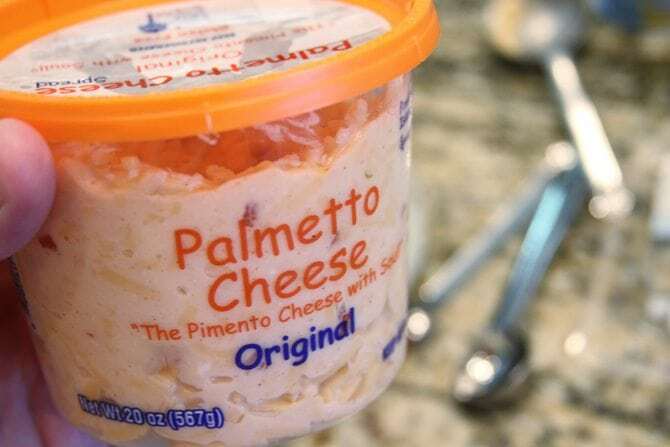 Thank you for using Palmetto Cheese, we appreciate it. I don’t usually comment on websites. However, all the comments above are from people who want to try the recipe. I think you need a comment from someone who made the recipe. We had these for breakfast this morning and really enjoyed them. We sprinkled some bacon bits on top of the pimiento cheese before adding the eggs. I also liked that they only took 5 minutes to prepare! We will try this one again. Awesome, Steve! Thanks for the comment and I’m so glad y’all enjoyed them!